For many in Canada, Easter means a ham dinner, scalloped potatoes, and a day eating cream-filled candy eggs. But from braided breads to roast lamb, take a look at some of the most popular Easter food traditions we enjoy from around the world. Maybe this year, try out something new from a local bakery or food shop. Two kinds of meat are popular at Easter: ham and lamb. Lamb, however, is the most traditional, because it is associated with the first Passover Seder of the Jewish people. Lamb is particularly common in European cultures. For example, in Toronto, many Greek families will enjoy roast lamb this Easter, often cooked on an open BBQ. In North America, however, ham, a symbol of luck and good fortune, has become the Easter meat of choice because years ago, fresh lamb wasn’t readily available. 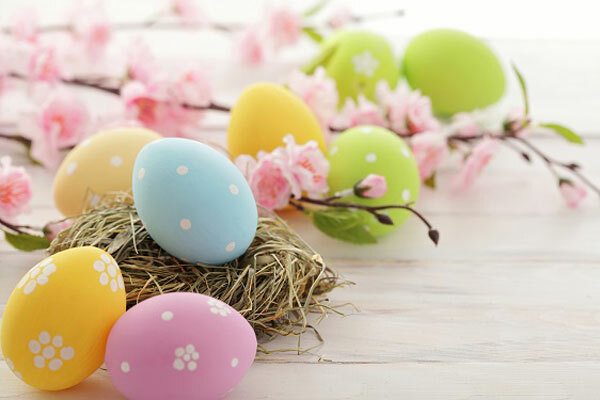 Eggs, an old symbol of fertility (for spring time) and a Christian symbol of re-birth, are probably the most popular food associated with Easter. In many traditions, hard boiled eggs are coloured for display or served as “deviled eggs”. A popular Italian Easter bread features coloured, hard boiled eggs baked right into the bread! Following on the egg tradition, chocolate and chocolate eggs were first created in the 19th century by the Cadbury Brothers who had worked to make chocolate easier to melt and shape. The first chocolate eggs were filled with sugared almonds and decorated with a marzipan flower. Easter cakes are a popular dessert and vary by tradition and custom. For instance, the Simnel cake, a United Kingdom tradition, is a fruit cake with a flat layer of marzipan on top and decorated with 11 marzipan balls representing the 12 apostles minus Judas. Other traditional dessert items are Eastern European rolls filled with a poppy seed paste, and the Polish babka. Babka is a fluted round cake, often studded with raisins, flavored with rum, and topped with sweet glaze. Hot cross buns are another favourite. In the early years of Christianity, the Church wanted to replace pagan traditions with Christian ones. So they replaced the small wheat cakes that the Anglo-Saxons baked in honor of the goddess of spring, Eostre, with spiced sweet buns that were blessed by the church and marked with a cross. Pane di Pasqua (Italian Easter Bread) fluffy, slightly sweet, rich and soft, like a brioche, flavoured with generous amount of lemon zest and a touch of ground aniseed. Easter Morning Biscuits, or Greek koulourakia, are crisp, honey-sweetened biscuits made from simple, non-rising dough — similar to cookie dough. Babka, Polish for “grandmother,” is a rich bread with raisins, named for its tall shape, which resembles a woman’s skirt. Paraguayan Chipa, a cheese bread from Paraguay has a dense, chewy texture.